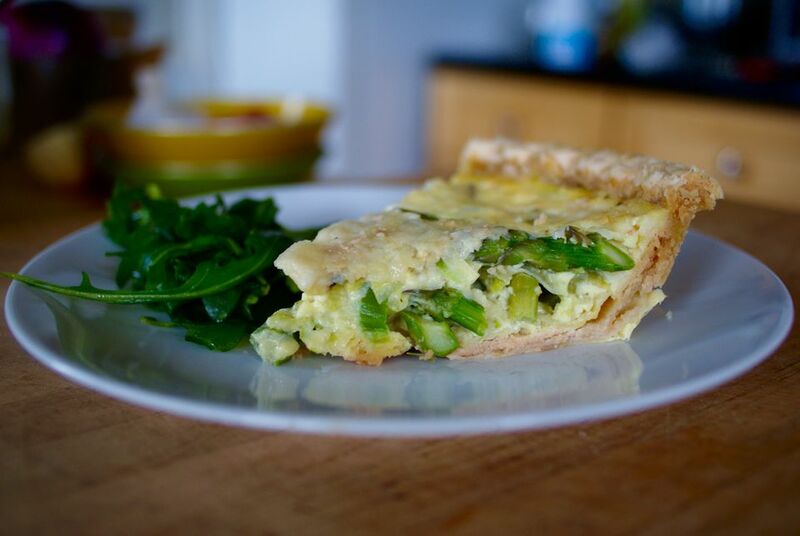 Bright spring vegetables get showcased in this easy, rich, delicious quiche. Sliced asparagus lends a wonderfully grassy green flavor, while slivered leeks bring a bit of sweetness to the party. This quiche is lovely for breakfast (bake it the night before, slice it when you're ready to eat! ), and even better freshly baked for brunch or lunch. I'm a fan of it for a light supper, too. Yes, I'm advocating that you eat this for three meals a day. Maybe not on the same day, but yes! Trim the leek: cut off and discard the root end and the dark green stems (reserve the stems to use in broth or stock if that's how you roll). Cut the remaining leek in half lengthwise, then thinly slice crosswise. Put the sliced leek in a bowl and cover with cool water. Swish around to loosen any dirt or grit. Let sit while you attend to the asparagus. Trim off and discard the tough ends of the asparagus spears. Slice the spears into 1/2-inch pieces. In a large frying pan over medium-high heat, melt the butter. Lift the sliced leeks out of the water and put in the pan (don't drain the leeks into a colander—you'll dump all the dirt back on them!). Sprinkle with 1/2 teaspoon of the salt and cook, stirring frequently, until tender, about 3 minutes. Add the asparagus. Cook, stirring frequently, until just tender, 2 to 3 minutes. Set aside. In a medium bowl, whisk the eggs and egg yolks together. Brush some of the egg onto the pie crust just to coat it. Bake for 5 minutes. Let cool to room temperature. While the crust bakes, whisk the milk into the eggs. Whisk in the remaining 1/4 teaspoon salt. Set the pie crust on a baking sheet for easy handling. Spread the leek and asparagus mixture in the pie crust. Sprinkle with black pepper. Layer on the grated cheese. Pour the egg-milk mixture evenly over everything. Bake until just set (the very middle can be just a tad jiggly), about 35 minutes. Let the quiche sit at least 10 minutes before slicing. Serve warm, at room temperature, or even chilled the next day. If you want to make your own pie crust, check out this recipe. But before you get started on anything else, have a fully baked (blind baked) pie crust in a deep pie pan ready to go.